On Sunday 24 September 12 of us got up at 4 am or thereabouts, and drove in a minibus from Newton Abbot and Exeter to Brighton and back, arriving home in shortly before 10 pm: a long day! 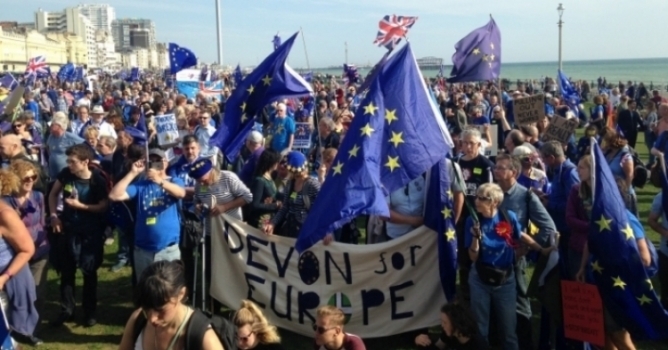 Information on this rally – timed to coincide with the Labour Party Conference - had been posted on the Devon for Europe website about 4 weeks earlier. We had a great day for a great cause! It’s often the case that the nearer you live the later you arrive, and it was certainly true this time. When we arrived at The Level in Brighton around midday there were no other marchers there, but they trickled in soon after us: from Oxford and Canterbury and many other places up to that sort of distance, and when the folk from Brighton and Hove for EU (who organised it) arrived, there really were a lot of us. When we marched, as in London, I couldn’t see either the beginning or the end of the procession. The weather was very kind to us, and it only started to drizzle as we were getting into the minibus for the homeward journey. The march stopped for a while outside the Brighton Centre, an unappealing grey building well shielded from the public, with frosted windows, but the delegates were returning from lunch and there was a long queue of them outside the building, so a lot of them saw us, stretching out along the seafront. 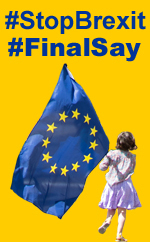 Many marchers were angry about Labour’s present inability to make a firm promise to at least stay in the single market permanently if not in the EU, and one chant was “Do your job” (to oppose the government), but some remain MPs including Chuka Umunna came across the road to talk with marchers, and an important aim of the rally was to make it easier for remain MPs to speak for Remain inside the building. The march eventually moved on, and ended with excellent short speeches from Caroline Lucas, Alistair Campbell (who played Ode to Joy on the bagpipes), and other excellent speakers..